First Listen: Temples, 'Sun Structures' It makes cosmic sense that Temples' debut album arrives at the height of the current nostalgia wave associated with the 50th anniversary of Beatlemania and the British Invasion. The young English band weaves its classic inspirations into crazy-beautiful, richly idiosyncratic music. Temples' new album, Sunstructures, is out Feb. 11. It makes cosmic sense that Sun Structures, the debut album from Temples, arrives at the height of the current nostalgia wave associated with the 50th anniversary of Beatlemania and the British Invasion. Like many young bands before it, the four-piece from Kettering in Northhamptonshire embraces — and proudly plays up — the influence of The Beatles and other '60s legends, notably The Byrds. But Temples' music claims its own place, weaving these inspirations into crazy-beautiful and richly idiosyncratic music. This type of inspiration/innovation circuit ran hot during the 1970s (see Badfinger, Harry Nilsson, et al), and Temples' iteration can be read as more proof of the enduring strength of the Fab Four's foundational ideas. Sun Structures proves that even after all these years, it's possible to reconfigure the songcraft details we know by heart — the graceful and surprising chord progressions, the buoyant close-knit vocal harmonies, the clever middle eights, the tambourines — into stunningly modern arrays of sound. For Temples, one key lies in "Day Tripper"-style two-measure guitar motifs; though the band's early press notices contain copious references to "new psychedelia" (whatever that is), the strongest musical cues suggest Revolver with buckets of reverb. The opening track, "Shelter Song," is built on a terse, perfectly catchy riff that every School of Rock songwriting teacher wishes he'd written. There are at least seven such guitar-code gems on the album, and each operates in a different way: Some function as recurring punctuation a la the Stones, while others, like the one that underpins "Move With the Season," serve to launch the music into breathtakingly open, spacious refrains. Surrounding these lead lines are blurry synthesizer pads and more commonplace guitar textures; here, the 12-string is used not to outline chords, but to conjure drifts of hazy, high-up-in-the-mountains fog. The misty, ever-evolving sonics suit Temples' lyrical themes, which tend toward the occluded and the mystic. Sprinkled throughout the verses of "The Guesser," "The Golden Throne" and the title track are metaphysical riddles and meditations on devotion, references to Eastern religion and fantastical stoner-rock nature imagery. Another indication of Temples' songwriting smarts: That woo-woo stuff is usually confined to the verses, and often gets obliterated by the crisp, businesslike focus of the refrains. Temples' sound is hardly nostalgic, but it does exhibit one clear link to the past: the crisp discipline of the classic pop hook. 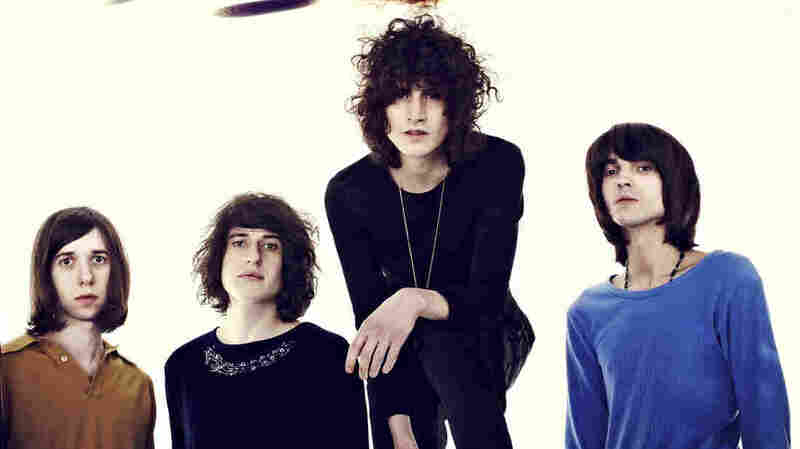 Temples began as a duo — singer/guitarist James Bagshaw and bassist Tom Warmsley — in the summer of 2012, drawing attention almost immediately with the single release of "Shelter Song." That led to a label contract and appearances on big-time shows (including one with The Rolling Stones), as well as two or three enthusiastically received subsequent singles. Those songs and everything else on Sun Structures were recorded in Bagshaw's house — a mixed blessing. The performances are vivid and relaxed, but the overall sound registers as just a bit blurry, lacking definition. In pure audio terms, Sun Structures doesn't get anywhere near the exacting sound of an album that's been frequently mentioned as similar in spirit, Tame Impala's wonderfully detailed Lonerism. But that shouldn't prevent musicheads from discovering Temples, because, as we learned 50 years ago, pop music this incandescent can overcome just about anything.